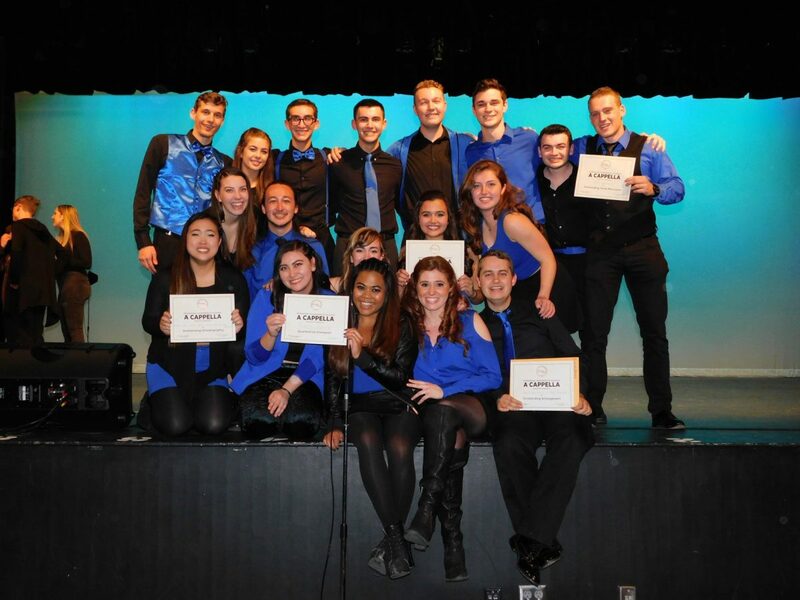 BisCaydence members showed off their individual awards after winning the ICCA South Quarterfinal Jan. 27. Photo courtesy BisCaydence. University of Miami’s own a cappella group BisCaydence smashed the competition at the International Championship of Collegiate A Cappella the ICCA South Quarterfinal on Jan. 27. Not only did BisCaydence win first-place with a score of 444/465, the group won every special category award available to competitors: Outstanding Choreography (Anna Park, sophomore, Maia Mulcahy, junior, Nathan Fox, junior and Jackie Rodriguez, senior), Arrangement (Kent Barnhill, senior and Matt Gagnon, sophomore), Soloist (Jillian Hobaica, freshman) and Vocal Percussion (William Ahlemeier, senior). Two other UMi a cappella groups, Phoenyx and Above the Keys, also competed in the south quarterfinal. Phoenyx singer Devin Weitz, sophomore, took home an Outstanding Vocal Percussion award. Above the Keys did not place or receive special category recognition. The International Championship of Collegiate A Cappella, or ICCA, brought to pop culture awareness by the “Pitch Perfect” film series, is a bracket-system competition for collegiate a cappella groups composed of quarterfinals, semifinals and finals. A total of 450 groups from universities across the United States and the United Kingdom compete for a slot in the finals, held in April in New York City. BisCaydence topped seven other groups in the south quaterfinal. Since BisCaydence won first place in the South Quarterfinal, it will advance to the region’s semifinal, held March 31 in North Carolina. BisCaydence was founded in 2011 at the University of Miami and has since performed at a Florida Panthers game, opened for Jay Leno and held joint concerts with other collegiate a cappella groups, including the Yale Whiffenpoofs and the Vanderbilt Melodores. The group placed second in ICCA quarterfinals in 2015 and 2017, qualifying them to compete in regional semifinals those years as well. BisCaydence released its first album, “Against the Current,” in 2017 on Spotify and SoundCloud. You can follow the group on Facebook and Twitter @biscaydence or on Instagram @biscaydenceum. Catch BisCaydence live on March 22 in their joint concert with the Tufts Beelzebubs.